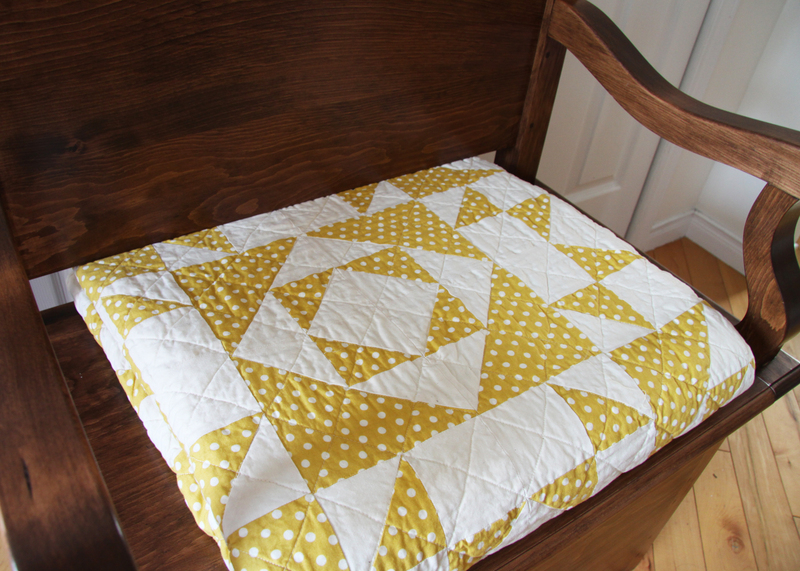 Phew, this one was quilted on deadline! 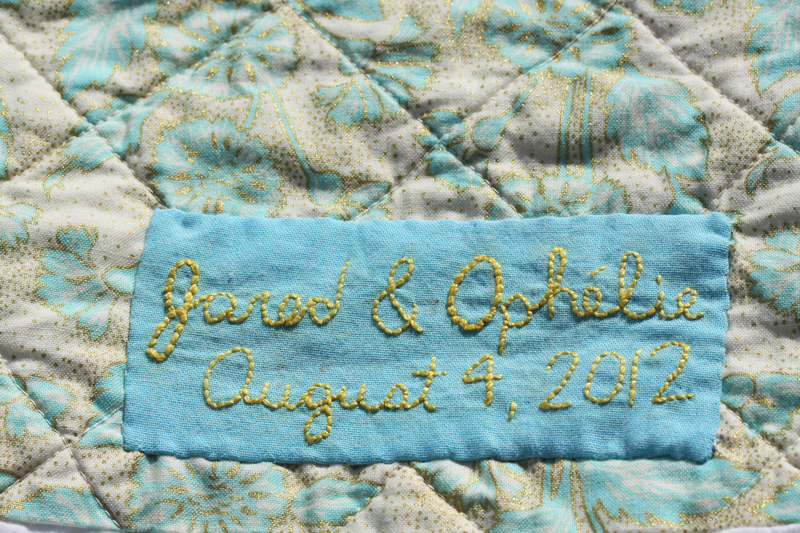 My friends Ophélie and Jared were married last summer with only six weeks notice, and it wasn’t enough time for me to get my act together and quilt them a gift. This year they came for a visit (and another wedding) and this time I was ready armed with a newly self-quilted, washed, and labeled quilt. I sewed on the label the day before Ophélie arrived for a weekend visit in Quebec. I’m quite pleased with it. Ophelie’s favourite colours are mustard and blue, and Jared’s is polka-dots. I think this makes the cut. I particularly like the one square that is unlike all the others. 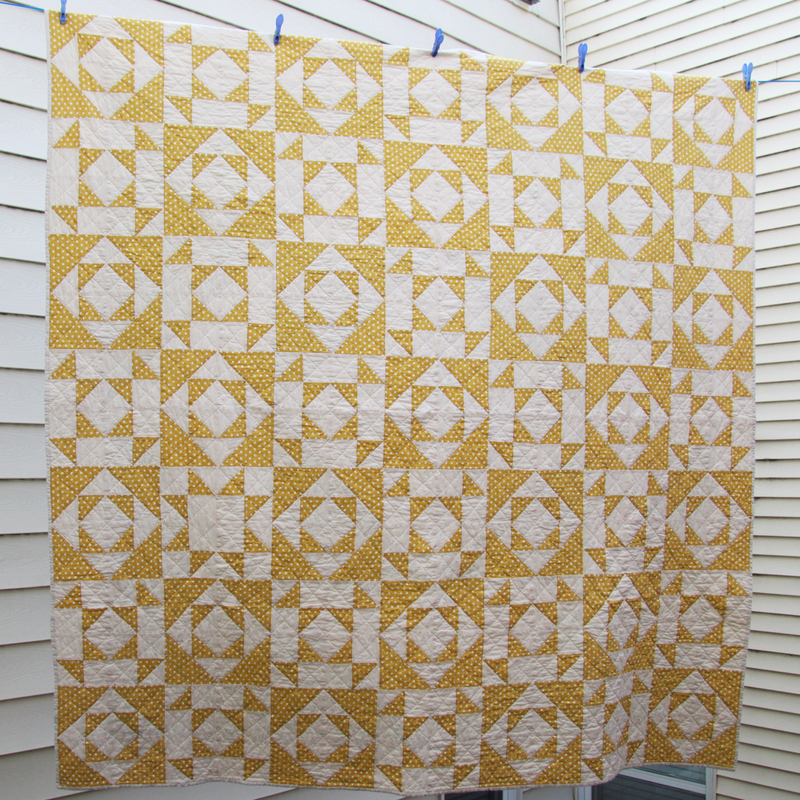 I think of this as the Sunshine Quilt and that square has something to do with it. When I saw it, I thought “I want to make one like that” then realized I think that a lot and it hasn’t happened often yet. But then, I (basically) did. Mine Is smaller (I should have figured out fabric requirement before going to the store, duh). 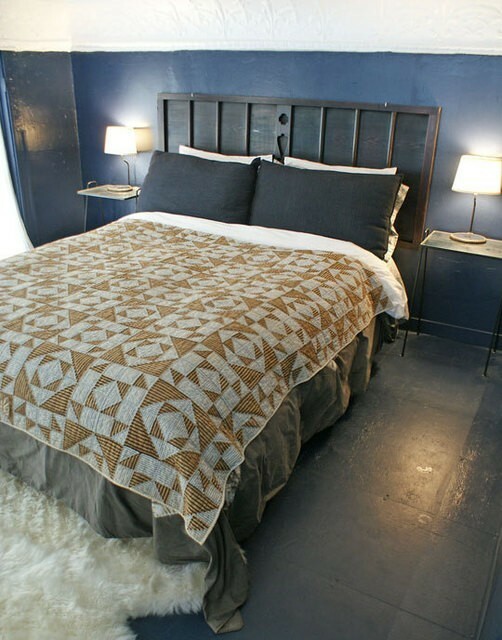 Final size: 84×84 which is fine for a double bed. Large scale piecing is quite fun and worth the couple extra hours it takes to make. I quilted this one myself on my little work-horse of a machine. Diagonal lines about 2″ apart. I really like the texture. That wood thing you see in this picture is another exciting finish this week. But it’s not mine. D finished his first piece of furniture in his cabinet making class and brought it home. He started with rough wood and ended with this lovely bench. 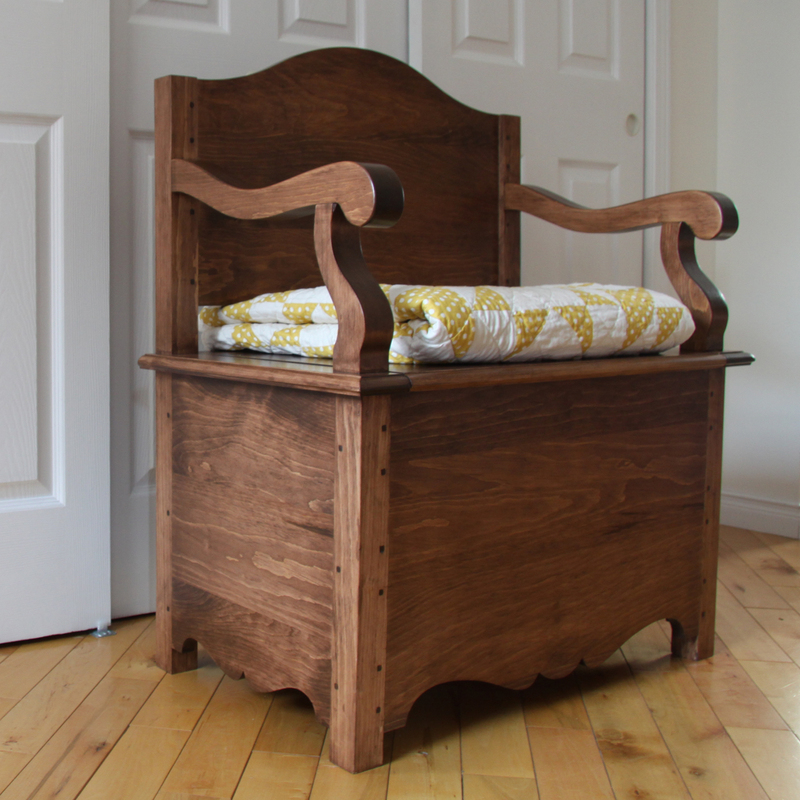 I muct say, I’m quite proud of him (and have ideas for about three other pieces of furniture he could make…). 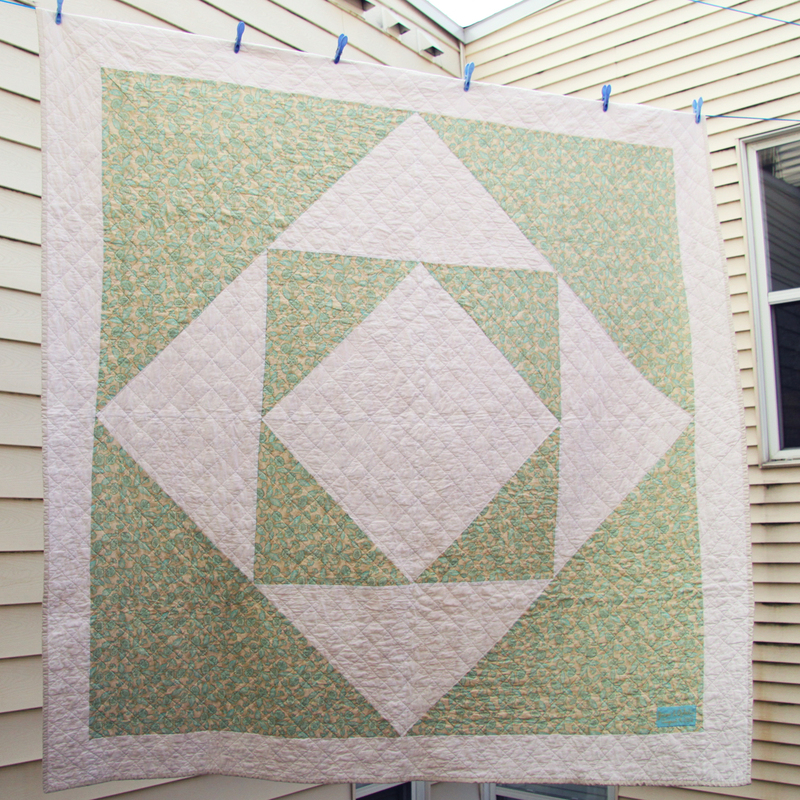 Linking up to Crazy Mom Quilts‘ Finish it up Fridays. This entry was posted in Quilting, Uncategorized and tagged block pieceing, crazy mom quilts, fabric, finish it up fridays, hobby, made by marika, madebymarika, marika, queen-size, quilt, Quilting, straight quilting, two-toned by made by marika. Bookmark the permalink. Like the quilt…and six weeks notice is definitely not enough time to get together a quilt as complex as that one. love this quilt – what pattern did you use? love the colors you used for it also! what type of batting did you use in it – has a great vintage look from the photos! Hi! I didn’t follow any published pattern for this quilt, but rather worked one out from the picture I found online. If I recall each block was about 10″ square (plus 1/4″ seam allowance). As for the batting I normally use the Heirloom Hobbs Natural 100% cotton batting from Connecting Threads. The price is right, and it handles well. Thanks for stopping by.